With last week's midterm election, Washington, Oregon and Colorado once again demonstrated the value of universally mailed ballots. 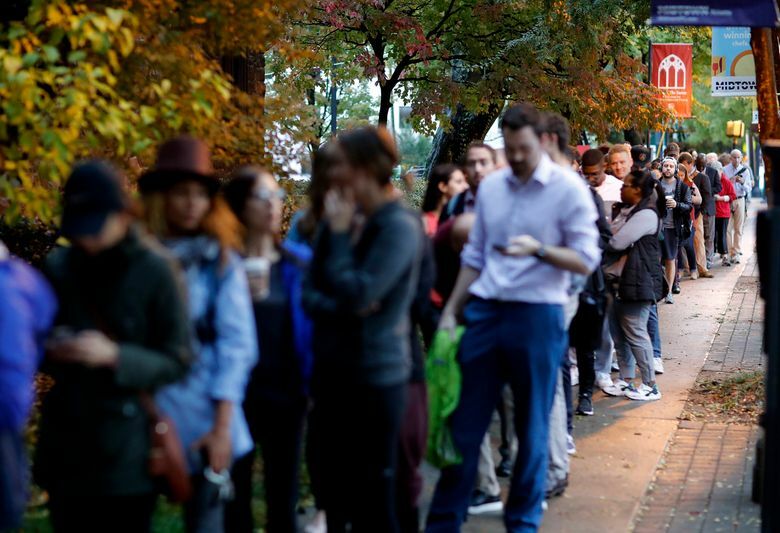 For Washingtonians who voted by mail, seeing video of people waiting hours to vote last week in Georgia was excruciating. It was like watching someone use a dial-up modem in the age of broadband. Other states should consider following the lead of Washington, Oregon and Colorado and move to universal mailed ballots. The convenience and access provided by this approach far outweighs concerns about security and fraud, which haven’t materialized after decades of experience. Washington Secretary of State Kim Wyman should help persuade them. Wyman is an articulate defender of voting by mail, which has worked well under her watch, and she’s co-chair of the elections committee for the national secretary of states association. She’s also a Republican, giving her credibility with GOP-led states needing to fix problematic election systems. “In the modern era, we shouldn’t be having lines around the block,” Wyman told this editorial board on Tuesday. There are vulnerabilities in every system, and security requires continual effort to update systems and respond to new threats. But concerns about the security of mailed ballots are overblown. Every state already trusts the U.S. Postal Service to handle ballots, by allowing absentee ballots to be mailed. Less trustworthy are voting machines that are vulnerable to electronic attacks and don’t produce a paper trail. What’s working here are actually hybrid systems. In Washington, Oregon and Colorado, ballots are mailed but voters can choose to return them either by mail or in-person at drop boxes and election offices. A better term than “vote by mail” is “vote at home,” according to former Oregon Secretary of State Phil Keisling, who advocates for increased use of mailed ballots. Keisling also makes a good argument that more states should move to “opt out” voter systems, which are designed to automatically register eligible voters and keep them registered, as opposed to “opt in” systems that erect hurdles for voters to participate and stay registered. Opt-out systems “lean forward” while opt-in systems “stand back and cross their arms and say, ‘You want to vote? You’ve got to do boom, boom, boom,’ ” he said. Universal mailed ballots aren’t perfect. Washington accepts ballots postmarked on Election Day, which delays the final tally as mail trickles in. But that’s a minor inconvenience compared to waiting in lines to vote; the latter dissuades participation and makes it unacceptably difficult for people busy with jobs and family logistics. More information about cost savings from mailed ballots would help, especially now that Washington state is paying postage. One prominent skeptic, MIT Professor Charles Stewart III, said he’s wary in part because a relatively large number of mailed ballots get rejected because signatures on record don’t match the ballot. That’s a legitimate concern that is addressed by Wyman and others at the vanguard. Keisling said the rejection rate is high because the number of mailed ballots is high; the question is whether mailed ballots are disproportionately rejected for some reason. Wyman makes a convincing argument that the rate of signature rejection should boost confidence in mailed ballots. The rate demonstrates a robust verification process. Voters also are notified if there’s a signature problem and given a chance to respond. Voting by mail gives election officials more time for this work. On the whole, Washington, Oregon and Colorado have now provided substantial evidence that their systems are convenient, secure and enabling above average turnout.